It may seem too early to talk about returning to school, but it's back in session in under a month around here. These crayon cookies have me pretty excited too! What's not to love?!? They are easy to make and fun to eat. Due to dyeing the dough, no royal icing is needed other than the simple, black details. These would be a great treat to pack in your child's lunch, or to serve as an after school snack. 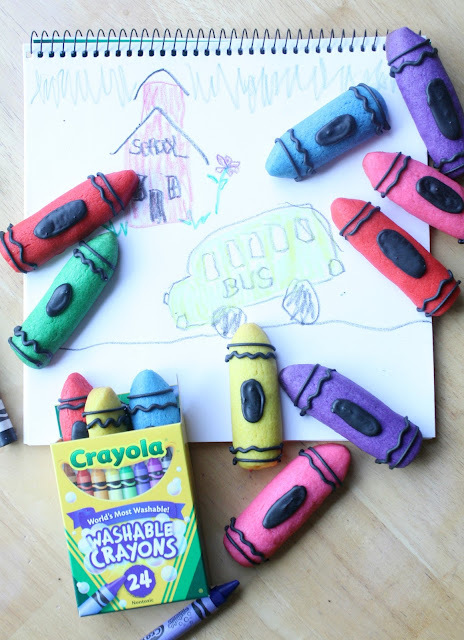 You can bet that these crayon cookies will be a definite favorite among the playground crowd! Whip up a batch of sugar cookie dough and royal icing. Divide the dough up and add a different color of food dye (I used Americolor soft gel paste) to each portion, blending it in thoroughly. Shape the top end of your cookie into a point. I used a small paring knife to help trim the tip and make it more pointy. Before baking, place each sheet of cookies into the freezer for about 15 minutes. This will help the cookies hold their shape. Bake at 350 degrees for 15-18 minutes. Let cool completely. Using black royal icing and a #2 tip, add the details to each cookie. Let dry. This recipe makes 7 dozen cookies with a few to spare. these are precious, so adorable. love the photos! These are so cute - and that art work is adorable!! I've actually been working on back to school too, I can't believe it's almost that time already!! I live colorful cookies that don't require a lot of icing. This is such a fun design, Sue! So cute Sue. And easy enough for even me to make. Great for back to school. Genius idea! 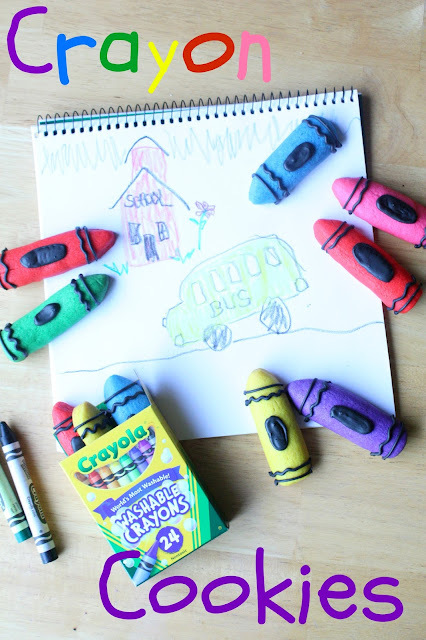 Crayons that children are actually allowed to eat! ;) very cute, as always! I love the idea of the dyed dough! They look really cute and simple! I love these so much!!! I'm going to make these for my munchkins first day of school! What a perfect lunch box surprise! But for us....school starts Sept. 10!!!! These are so cute, Sue! I'm not ready to go back to work yet so I don't want to think about school starting =o) But we did go buy our school supplies for Sept. and you're right, my kids were so excited. They love picking everything out. They would love these cookies! Aww these are so clever and I had to do a double take when I saw them! I thought that they were crayons! these are the cutest cookies. My kids might just pick them up and start drawing. :) So cute and look so real! So cute!I love the fact that there isn't too much icing but that they're still so fun and colorful! These are so cute! I think they're some of my favorite ones you've ever made! First year we won't have anyone in school! No tuition! Yeah!!! These are adorable. I have been MIA and had to check old posts. super cute and adorable!!! I love them!! These are adorable! Will feature tonight...love them! Such cute cookies, dying the dough worked really well. Another cookie of yours that I'd love to make. Oh what fun my kids and I would have with these! Thanks for sharing!